I’m standing in the kitchen chopping lettuce and marvelling at the emerald-green beauty of my home-grown rocket, feeling very much like Nigella Lawson must feel every time she steps foot in front of a camera. I lift my gaze demurely from the chopping board and look into the garden where my Mister is behaving more oddly than usual. He’s standing very still, bent over at the waist and peering intently into the bushes. I watched for a while, mildly curious about what he was doing, and then went back to being the talented kitchen goddess that I am. It’s not that I don’t love my Mister very much – I do. And it’s not that I don’t share in his interests either – I do. It’s just that I’ve learned from experience that sometimes it’s much easier not to ask. 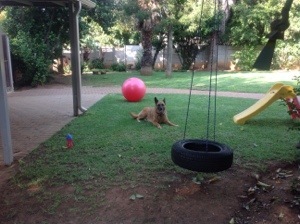 So there we were: my Mister marveling at something in the bushes; Holly mincing around with her big pink Pilates ball, Idumbe the dog licking the bricks and me making an amazing dinner for my family. Next thing Mister interrupts my gourmet reverie and asks me to Google ‘olive thrush nests’. It turns out the thing that had him beguiled was an olive thrush fledgling flopping around in the bushes. 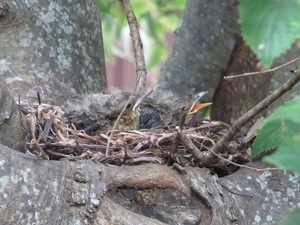 Mister’s big-hearted plan was to locate the nest belonging to the thrush family and return the baby bird to it. Once he had a visual on the birds’ home he bolted off to go and build himself a scaffolding to reach the nest. We don’t own a ladder. Again I peered out the window and was somewhat concerned to see him balanced on a garden chair that was resting precariously on top of a hard plastic children’s toy. All of sudden Mister flung himself from his home made construction and bolted inside yelling breathlessly to me: ‘There’s another bird in there!’ As if he’d looked in a window and seen an elderly lady in her bloomers. Turns out he had the wrong nest. I suppose it happens to the best of us. Anyway to cut a long story a little shorter: he phoned an all night vet, explained the situation and was told that the fledgling would spend some time on the ground and, as long as the parents were around, it would be fine. 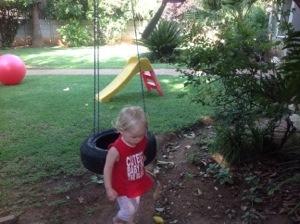 This Sunday has been witness to similar shenanigans: Mister decided to hang a tyre swing for Holly. 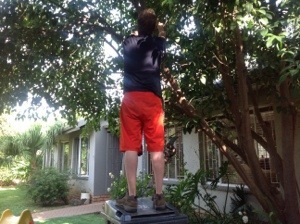 Again, without a ladder, Mister made do. This entry was posted in Banter and tagged bird life, fledgling, gardening, olive thrush, Sunday, Sunday afternoon, tyre swing on February 16, 2014 by simonewb.